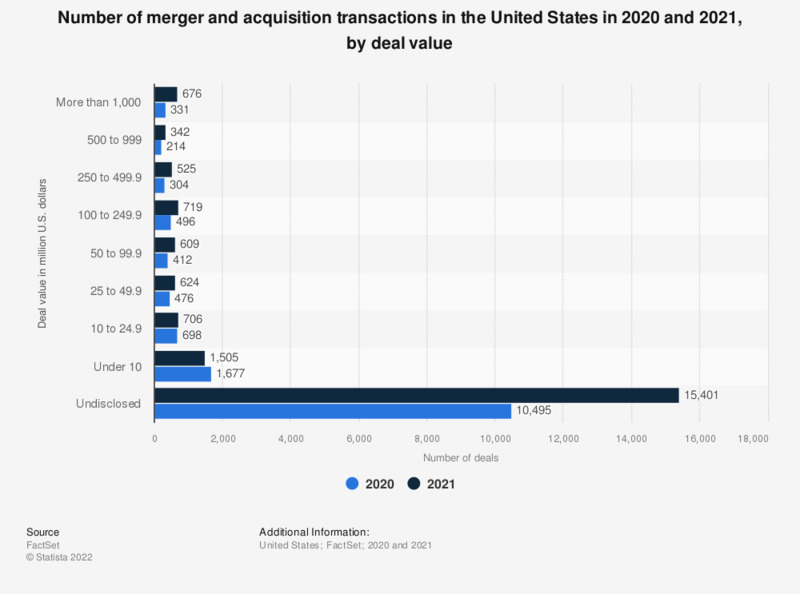 The statistic presents the number of M&A deals in the United States as of September 2018, by deal value. In that year, there were 375 M&A transactions valued at more than one billion U.S. dollars in the United States. The overall number of M&A deals in the 12 months ending September 30, 2018 amounted to 12,688. Merger and acquisition (M&A) refers to the consolidation of two companies. The value of M&A deals in the U.S. amounted to nearly 151 billion U.S. dollars in December 2015. In the United States, commercial services sector accounted for largest share of merger and acquisition deals in the United States. Yet, deals in the industrial services sector had the highest overall transaction value. The majority of the M&A transactions in the U.S. did not disclose their deal value. From the ones that revealed their figures, a total of 917 deals were valued under 10 million U.S. dollars. This number corresponds to about a quarter of all deals with disclosed value. Deals valued at more than a billion U.S. dollars amounted to 375, while 626 deals were valued between 500 to 999 million U.S. dollars. In 2017, the largest M&A deal in the United States, which was the acquisition of QUALCOMM, Inc by Broadcom Ltd, was valued at 88.21billion U.S. dollars. Goldman Sachs was the leading M&A advisor in the United States in 2015, managing M&A deals worth approximately 116 billion U.S. dollars. Lazard came close after, with about 85 billion U.S. dollars in M&A transactions. Everything On "Mergers & acquisitions" in One Document: Edited and Divided into Handy Chapters. Including Detailed References. Statistics on "Mergers & acquisitions"
Do you anticipate that technology valuations will increase over the next 12 to 24 months? Which region do you consider the most willing to pay premiums? In your last acquisition, which of the following attributes of the target company was important in determining its valuation? Of the following European countries/regions, which do you think will be the most active region in terms of technology targets? Do you think the IPO market impacts technology valuations?